Today, I cheated! I did not click a picture. Instead what I have for you is a screenshot. Yeah, so sue me. But hear me out first. When I wrote about Milaap Indiblogger Meet, I knew I did not want it to end there. I had made a promise to help. And so, I was going to do exactly that. I turned to FaceBook and Twitter. My friends saw this status message this morning. I need help! Can you loan me Rs 500/- for a year? I promise to pay it back at the end of 365 days. If you think you can, please head here. 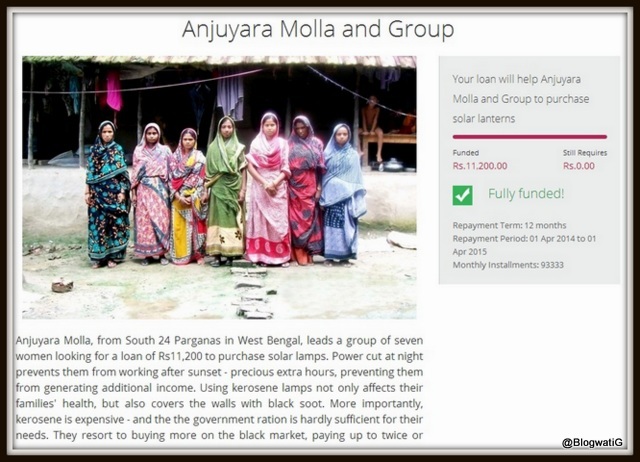 Anjuyara Molla and Group need solar lanterns so that they can live and work in safe conditions. ‘Light’, something we take for granted, is a luxury out here. Can you find it in your heart and somewhere in your pockets to bring some sunshine in their life, after dark? I am hoping you will say Yes, happily. They are only Rs 9700/- short! And before I knew it, help began to pour in. By midday, we’d completed this loan to the tune of 95% contribution. Yee Haw! We then moved to the next borrower, Gouri. Happy to state, we managed to fully fund this too. With some help, of course! Now we are working for Amudha. Fingers crossed, this will fall in place too. As I write this, she still requires Rs 23,200. And yes, I am hoping that we will close this deal. Today, I dedicated my day to women who don’t know me, but need me. I have this warm fuzzy feeling that refuses to go away. I know I wanted to use my blog to make a difference and not create one. More than that, I believe that when you raise your voice may it be for the right thing. And I am so glad that so many of my friends paid heed to that clarion call. My heartfelt thanks to each one of you. God bless you and keep you safe, always! UPDATE as on January 16, 2014 : All the 3 borrowers above have been fully funded. We raised a little over Rs 36,000/- with this venture. Milaap generously showcased this effort on their Social Media page. An effort to tag every donor has been made on that thread. UPDATE as on February 5, 2014 : This post was recognized as a valid contribution to the #HopeProject Contest by Indiblogger and Milaap. YAY US! God bless Vini…this is an amazing thing that you’re doing. And thank you for helping. I guess that’s the only way we all can progress. Help the ones behind us. How good, how absolutely marvelous it feels to be part of something like this. Thank you vini, for giving me the opportunity ! Thank you for being so generous with your deep pockets. Much love to Aunty too…………..like mome, like daughter. Honestly, Dagny, I did zilch. It is the people who responded to a random status message that deserve the applause. Feels so wonderful when you do something for someone else, doesn’t it Vini? I am glad you shared that with us. Thank you for taking out your time and mobilizing support! God bless! It totally does, Rachna. And it makes you wonder, why can’t we be like this for a better part of our lives? Thanks Sakshi. Everyone earned the blessings themselves. They chose to do it, out of a generous heart. And I am grateful to each one of them who read and responded.